My God... crying so hard at work right now. This entry is a marvel of emotions. Nearly brought to tears by these photos. Words cannot express how emotional they are. I hope with all my heart that the aid starts to get through and the Haitian people pull through - they've suffered more than any of us can imagine. Thank you for compiling this gallery. I think we've all grown tired of looking at the images of devastation, and wanted to see some images of emotion and hope. I teach a lot of Haitians in Philadelphia and even here we can feel their pain and loss. It is amazing how such a world can exist so close to our shores. Maybe now the world will pay attention. Of course it may be too late. Wow. This is far and away the most moving, heart wrenching, and emotional collection of photos I've seen since the beginning of the quakes. Il mio abbraccio ai sopravvisuti, il pianto per i caduti. An amazing set of images. thank you so much for posting these and your great work! also and even more importantly for all the great work everyone is doing in haiti!!! Awesome pictures Alan. I'm Dominican, we're doing the best be can, hope is the last thing you can lose. Human nature can make us do crazy things sometimes like we see in the images above. Haiti is getting all the help they can get but they must start by helping each other. Sh*t... These one brought tears to my eyes, number 14.... that's a powerfull one. Damn. they need help!we need help them! This set of pictures conveys the suffering of Haitian people more than any other pictures or videos. Truly heartbreaking! You can feel the pain and suffering when you stare at those eyes! Picture #14 made me tear up pretty bad. I was thinking, what if that was my child?! The Haitian government should be held accountable for such a bad or no response to such a catastrophe! The lawlessness seems to be affecting how the international aid is being distributed. It seems like even the police who is suppose to protect the public are free to shoot any looters they want. Granted it's wrong to steal other people properties but using live bullets is just wrong! Are the police working for the Haitian elite or are they working for the people! Thanks to those countries who sent doctors, nurses, volunteers, rescue workers, medicine, food, water, money and soldiers to keep peace in a country that needs it pretty bad. THANK YOU VERY MUCH! So moving, the pictures say so much. I looked through them twice, and then sat and showed my 15yr old daughter. We both ended up with tears rolling down our cheeks. Es una pena lo que a ocurrido en el hermano pais de Haiti. The children at our school are emptying their piggy banks to help. Amazing how these images convey the feelings so well, I dream of reaching this level of photography one day. ..but that was the point. #3 got me good. Among all the pain and chaos lies her smile. Can we _please_ stop using the word looters. How about "resourceful survivors repurpose materials salvaged from the debris." What beautiful people! Praying for all of them right now. Your testify is priceless ! touching pics ,that's so sad. we need to help them . Great pictures, but I didn't see any looters - I saw desperate people using what's available to survive. The word "looting" just doesn't apply in these kinds of circumstances. The sway of emotions - rolling - from photo to photo. We have been so inundated in a media blitz of streamed consciousness for the last 9 days, our own numbness is setting in. But these photos ... no more silent than the maw of emotions roaring upward out of our bowls as we view them ... play an anthem for all humanity to hear. These images accost, heal, repulse, attract, tear, suture, conclave and disperse in concert as we view them. These photos serve as a collective jolt back to reality of the need in Haiti. Frames 43-46 are so powerful. In four images, they cover the entirety of the agony and the ecstasy of the human condition. Images worth revisiting, regularly. None of us can afford to allow the need of the Haitian peoples to escape our current consciousness. For none of us are more than the flick of a gnat's wing from being the next desultory of nature. Picture # 8 moved me a lot because iÂ´m Mexican and iÂ´m cryin too, iÂ´m very proud of all the people from all nations who are there helping and trying to give some comfort to the people who lost everything. Realmente es muy triste lo que esta sucediendo en Haiti. Por suerte, la Republica Dominicana ha mostrado toda su solidaridad con el vecino pais. Ojala la ayuda internacional sea menos burocratica y que lleguen lo mas pronto posible para evitar que sobrevivientes al Terremoto sigan perdiendo sus vidas por falta de alimentacion y atenciones medicas. es triste ver por la situacion que vive ese pais pero lo mas triste es ver como se sarvan algunos del sismo y luego lo mate un policia por un poco de comida que con la situacion que atrviensan estan desesperado yo le pido alos militares que se pongan en su lugar a unque sea por un dias para ke se den cuenta el porke estan desespera porfa paciencia con los ke sobrevibieron a esto ke es grade. God, send help for these beautiful people. Thank you Big Picture. These took some time to look through... time to really take in the situation. I have two hands and a heart. I hope to go there as soon as possible. Maybe this summer. Desde EspaÃ±a, gracias por el aporte. Impresionantes imagenes... ... Mucho dolor en los ojos de los niÃ±os. Heel veel sterkte voor de mensen in Haiti!! Veel liefs voor iedereen daar! These are the most thruthful images I've seen so far. It's just provides me with the confirmation that even though a lot of people died they are still survivors fighting to get back to their feet. Thank you for sharing this to the world and let angels, archangels and light workers provide that country with the necessary light they need to keep on, surviving, having faith and living, one step at a time. This gallery is super incredible. A hell of a lot of emotion and some really good images, wonderful and painful moments. My only complaint is that, from a photojournalism point of view, I really wish the captions had names. An image says one thing, but a caption adds a lot to it--they connect you with the people in the images. I feel like I'm missing out on a lot of story. FACES OF PAIN. I have to pray more, I can : "feel" somehow their emotional pain. Is sad. I pray for their relief. How much I wish to be there for them, and help them out. we, In Dominican Republic can feel their pain and loss every day. GOD BLESS ALL THE MEDICAL, SPIRITUAL AND ORDINARY PEOPLE WHO ARE THERE DOING A TREMENDOUS JOB TRYING TO GET FOOD, WATER AND MEDICAL & SPIRITUAL HEALING TO ALL THE VICTIMS..GOD SPEED TO ALL THE VICTIMS. Life Goes On! - #46 is Beautiful. Alan, keep the light on the people of Haiti. These pictures are so much more powerful than words. As you can see by the comments, they touch a part of us sometimes unreachable by letters on a page. Thank you for your compassion. Since when did scavenging become looting? #44, 45, and 46... life goes on. just i can say, blessing for this peolple. Â¡QuÃ© tales fotos! Impresionantes y dramÃ¡ticas. May your life be filled with blessings, little baby #46.
Who determines the difference between "looting" and "salvage"? "looters" is a loaded word, clearly subject to misuse; yes, there are many escaped criminals & a resurgence of gangs and yes, there are people trying to protect what's left of businesses-- but since the news continues to be how supplies are bottle-necked at the airport and port, wouldn't it'd be better to err on the side of those suffering and not use this label? #13 - Thank you to all the health professionals who are there. You inspire me to train in disaster relief when I finish my medical education. ..bless peoples that help you. Very moving and makes you realise the problems of you & I are trivial compared to the life & death situations, the utter desperation these people are experiencing. Where's the lord someone asked we he aint there like he/she/it isnt in a lot of places of this earth so much suffering every day of every year yes I'm agnostic but sincerely wish sometime I would be proved wrong. The last photo is superb and one of hope for the citzens there. What's up with the policeman killing a 15 year old girl (Pic 43)? She was looting, yes, but she was 15 yrs old!?!? That's ridiculous! GOD BLESS ALL OF THOSE WHO ARE HELPING THE PEOPLE IN HAITI . I WISH I COULD HELP BUT I DO HAVE PLENTY OF PRAYERS FOR THE PEOPLE OF HAITI MAY GOD BLESS THEM AND KEEP THEM STRONG WITHIN THERE HEARTS WHEN THERE BODYS GROW WEAK . What an excellent choice for the last photo, to close the gallery - life, after all... thank you. Doctors and emergency medical personnel, along with medical supplies are still badly needed and are in short supply! If any one can help, please contact the Red Cross or other aid agencies working in Haiti asap! Please pass this along so that others may help. Dios aun esta en comtrol. todavia no se acaba su misericordia para todos. Alan, thanks again for all of your hard work collating these photographs. I have shared your links many times over the last few years, but none moreso than these 4 about the devastation in Haiti. My thoughts and best possible wishes go to all those affected and to those helping and attempting to help. tambien hay personal de la REPUBLIC DOMINICANA trabajan y colaborando con las personas de haiti....mucos DOMINICANOS colaborando en ese pais. Por si no lo saben.. Sorry Rachel, but political correctness does not make looters noble people. They are thieves, and they deserve whatever reaction happens to them for taking what is not theirs. Everyone else is in the same boat, no one has a right to take what is not theirs at the expense of others. Period. Sorry Eric, but human lives are more important than property rights. we are tiny before the nature. poor ppl of Haiti. i would hate to be them. Oh and not to be mean but they need to get together and help each other out instead of fighting over each other. I so appreciate this website. Pictures truly speak a million words. Beautiful work in capturing the intense suffering. I am saddened and sickened that a 15 year old was killed for stealing a painting (which would have probably been bulldozed away eventually). To think a painting is worth more than a human life. Awful. And I can not call the young man eating a bag of found chips a looter either. Any one of us would do the very same thing if we were hungry and homeless. Chances are the chips would go to waste. Such frivolities in such desperate times. 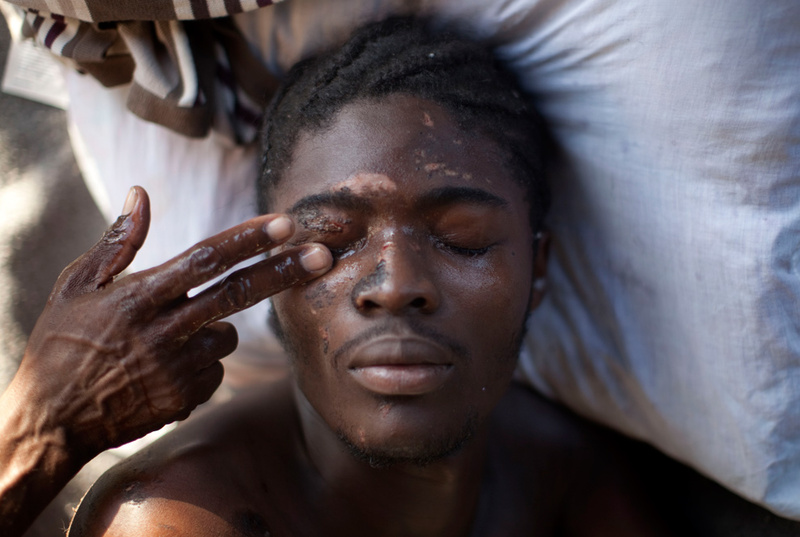 beautiful photos capturing the heart of the haitian people during this tragic time. God bless Haiti! God bless the people of Haiti. May God give them strength to stand up strong over this tragedy. Hopefully, more people comes from other countries to help them. Being homeless with two children at one time myself due to domestic violence, I would have done anything to keep them fed. I was lucky, there was a food bank to go to. What if there wasn't? Yep, I be digging through the rubble to find food for my kids and myslef. How can it be looting when the only food and wanter is in rubble. Honestly do you think the store owner cares at this point? I think they would want people to eat and not starve. I do not believe the letter of the law was intended to make people starve, do you? Eric, I really wonder if you'd have the guts and the moral strength to stand and just watch at some food while maybe your kids are screaming for food a few blocks away. You really believe you'd leave that loaf of bread behind, walk home (or whatever is left of it) and say "sorry my son but that food didn't belong to me"? Waow. It saddens me and angers me that the "looter" are not recognized as survivors. That they have the audacity to kill the individuals who are trying to exist. I do not understand how they expect desperate people to stand in orderly lines. I don't not understand how water and simple rations can not be rapidly distributed by helicopter. I do not understand why we don't hear how big pharma and the Walmart's of the world donating massive amounts of medication and supplies. I guess when it comes to looting vs. scavanging vs. surviving. If you found a bottle of water under rubble, would you take it? I can not see all the Pix.. i m not able to say nything. they really need our help... God bless them.......... i wil pray for them al the time..
May God gives powers and peace to people of Haiti. It makes me mad as HELL when I think of all the SCUM in America that have used, robbed, stolen, ect...The Crooked Politicians, Rougue Cops, Fat Cat Bankers, ect......Why can't there be real justice? Why do people with nothing to begin with have to suffer even more? Just when you think you've had a bad day.......the Big Picture brings you back to earth. Sometimes the world is a cruel place. May God have mercy on those people. picture 46, life goes on! As Canadians we have no idea the hardships, the losses and the pain that these poor people are going through. My prayers go out to them all to stay strong during such a difficult time. I am appalled at the police shooting people for stealing food...these poor people are desperate and starving. Is it really necessary to shoot a 15 year old girl because she's stealing in such a time of crisis!!?? I would love to adopt one of those beautiful little ones that are without parents today. God bless them all! Thank you to all the photographers who took these heart-wrenching photos. Well done!! Let's hope they jerk some moeny form the rich people and rich countries of the world.How can the wealthy of the world stand by and ignore this. The bankers and others who have made their money at the expense of the poor should donate all their wages and bouses to aid those who have nothing.They won't because they are a heartless and selfish bunch.. There is no such thing as a LOOTER under these circumstances. These are just desperate, starving people trying to survive. Any spoils from this disaster are up for grabs. Why should the food lay in the rubble while people die!? Stop killing looters. They are victims. It is really heartbreaking to see what these poor people are going through, and I thank God that my loved ones are not affected by this. The police need to lighten the F up. With all of the death and destruction, who cares if people are looting?! Thanks again Alan. These images speak volumes. All countries sent help to haitian people, so how come only israeli and american efforts are shown on these photos ??? Looters...that's what they are. Looters steal everything...survivors steal only food, water, medications....neccessities. The poor girl was "killed by a policeman while looting wall hangings." Are wall hangings needed? Edible? Can you not see that desperation is forgiven, profit is not? Unabated looting and thuggery only encourages others to do the same...TV sets, A/C Units...remember New Orleans? Allowing people to loot brings even more chaos and disorder. I'm sure she was ordered to stop, but, thinking like some of you, she did not realize an order in this situation must be obeyed. It is horrible and tragic that she died and the the police there do not even have less than lethal weapons. Horrible and heartbreaking all around. Where is the help? What a shameful, backward government!!! The poor people of Haiti deserve more help! Rescue is over!!!??????? The buildings are made of cement blocks, wood, etc. They are not steel and concrete like in the U.S.. There are many others still alive in pockets....everyday they are rescuing people. Why give up so easily? The elements are not inhospitable...there is no cold, no snow, etc. Construction is pretty simple. The buildings flimsy. People can do amazing things, but not when bulldozers run over them. LO BUENO DE TODO, ES QUE NO ES POR BURLA, ES UNA BUENA EXHIBICIÃ“N Y SE MUESTRA EL TRABAJO. JUNTOS PODEMOS LOGRAR UN CAMBIO. TUVO QUE SER HAITÃ� EL DETONANTE, PERO TODOS PODEMOS AYUDAR DE UNA FORMA U OTRA. Many of the above comments chastise Alan for using the word 'looters', asking how/why folks are earning that label simply for trying to survive. Those saying such things would do best to consider that not all looting is done for purposes of survival. Case in point: #43. The caption states that the wailing woman's daughter was killed while looting wall hangings. Not food, not water, not medical supplies. No: decorative artwork. It's a shame, of course, that a 15-year-old girl lost her life over such a petty thing (after God Himself ruthlessly killed 100,000+ seemingly on a whim), but that's life. And that's death. The fact of the matter is, the prevention of rampant looting after a catastrophe is one of the four cornerstones necessary for society to regain its wobbly footing amidst the chaos. Medical care; food/water; shelter; law and order. There are several very good reasons even advanced societies maintain "looters will be shot on sight" laws. Stupid American military! Always have to be where they aren't wanted. American PIGS! Oh, wait...they're helping people by being the first on the ground to provide aid. Must be because they have a black president now, since George Bush hated black people. Could you put up some pictures of Iraq or Afghanistan, so we can go back to hating the military troops? J. T. and Jim Pettit: People are salvaging wall hangings to make shelter. There are tens of thousands of homeless people in makeshift tents because their houses have collapsed. And it reminds you that these people will have to live with these scars for the rest of their days. It's amazing to think and realize how the whole world really does come together in such a crisis. es increible como este ese pais hoy, tenemos k saber k hay un dios muy grande y nos ayudara a ayudar esas personas y niÃ±os k hoy nos necesitan, dios esta siempre con ellos en cada momento k pasa. dios los bendice. Lump in my throat and tear in my eye. One of the most moving sets I think I've ever seen on this site. As the workers of Partners in Health know so well, he Haitian peoples have been enduring a state of emergency for so many decades--in a larger sense, several centuries, ever since the Europeans first colonized the land and dragged thousands of routinely kidnapped West Africans to labor, and see their vchildren's children labor, enslaved for the profit of their captors. That it takes a disaster of this magnitude to engage the active concern of more privileged folk worldwide is a wretched truth. But let this horrendous loss be at least the catalyst for a genuine longterm commitment by lots more organizations to assist the Haitian people in their efforts to build a sustainable future for the poeple. God bless them, and all who labor to help. Great shots! But I'm missing some photos about the Brazilian troops and his help. I hate the word "looter." These people are just trying to survive. Cut them some slack! i wish i could be there right now helping. this is so sad....very touching pictures...This is just too much for Haiti. Haiti is in dire need right now for help...Haiti needs the world right now to help them out and the world's prayers.....God Bless Haiti! Excellent excellent, fine artman ship, I love the hair , the skin, the breasts, everything, the emotion. I love the tear stained faces. Excellent photos. I need to give some cash! There are so many there who will need help in a month, a year and in two years. Find the long-term workers and those who are making a difference and support them as well. I'm glad America is there. "From God do we come and unto Him do we return"that is what gives us peace and a relief after such a calamity which destroyed Haiti. Really special pictures, they give a good impression of the horrible situation over there..
beautiful, scarring pictures. However, use of the word "looting" in the context of this disaster is disgraceful. Whoever wrote the captions does a disservice to the photographs. My wife and I both gave blood and 400 dollars each to Red Cross . Let Lauren and I know in comments if this is the wrong way to help out or if there is better way to help out . Que fuerza en aqullas imagenes,no pueden dejar indiferentes a nadie. Seeing the crush of people in the food lines it is so easy to scream 'just give them food' but realize that this is a DISASTER there is no infrastructure left, roads are blocked- rubble everywhere. It is beautiful to see so many countries coming together to help the people of Haiti. This does not come easily, it takes time to coordinate. Do not be harsh in judgment. The people are scared, there are many aftershocks. Hopefully as the days go on the people of Haiti will know that they are not alone, they will have food, water, and shelter- it will just take time. 200,000 dead,2 million buried,i wonder what is the population of Haiti,did the earthquake hit the whole country? Thyanks for the pics. "A picture is worth a thousand words" is still very true. Amazing shots but just for tell us how much we have to continue praying, helping in every way to find the relief for them. Solo Dios puede dar consuelo en un momento asÃ­, Se k es dificil tan solo ver las imagenes pero Basta saber que Dios esta aqui. Excelente trabajo documental del terremoto de HAITÃ�, tremendas imÃ¡genes y de muy alta calidad, felicito al fotÃ³grafo son imÃ¡genes que hablan de lo fuerte del momento y levantan sentimientos indescriptibles en quien las ve. Photo Number 41 touches me deeply. I think people would rather help each other, I think you're the same opinion as me. It's hard to see her ... Where is God for these poor people. Photo number 34 really made me very touched by seeing young people catch to nourish ..
it is a very bad tragedies who appenred to Haiti. Wondering where are the Brazilian soldiers in this photos. They have working hard to keep Haiti safe during the last years and now what? Desappeared? AS US SOLDIERS came from the sky? Learning from my experience with organizing during the Tsunami in January 2005, this time around, I refrained for looking at ANY photographs, video news reports, anything which could haunt my days and nights in my mind's eye. It was only until this moment that I trusted by gut to type in the url and see humanity here in The Big Picture. These images bear witness to humanity's struggle to smile despite everything. People in Haiti are really suffering. The human misery is unimaginable. It would certainly take long for people to resume their normal lives. Hope there is no major disaster in near future and the world community is given chance to concentrate their efforts in rebuilding Haiti. Why doesn't the world force France to return the thirty-some BILLION dollars it LOOTED out of Haiti? Haitians could then independently progress, as they would have, had they not been violated by all the countries who failed to uphold justice when it mattered. Without total restitution, their aid is hypocritical farce. Go back to the history you skipped to find out WHY Haiti was made so destitute. Haiti was once a paradise. Ce n'est un drapeau qui sauvera la planÃ¨te !!! On se fout que l'Americain, le franÃ§ais ou l'espagnol soit prÃ©sent ou non... Seul l'Ãªtre humain peut sauver l'Ãªtre humain !!!!! that's what it is eh ? may they all be blessed by the good will for survival and may all the fight for food end. incredibly good shots and intresting choice of the order. This is truly heartbreaking to see these poor people go through all of this. May God be with them in there hour of darkness. May God also be with all of the people there to help. To Han Solo: your comments are only proceeded by your ignorance. As far as the U.S. military goes, yup, they are in places they aren't welcome at times, as they serve our Government. However, go to this URL http://en.wikipedia.org/wiki/Operation_Unified_Response to educate yourself a bit before doing yourself the disservice of making a fool of yourself in such a forum as this. Quite a few tears, I wish I was there to physically help. May they be in all of our prayers, especially as the weeks turn into months and years. GOD BLESS! the new baby that was born after the eathquake is so lucky. Really great pictures of this tragic moment in Haiti! >>"GOD BLESS ALL OF THOSE WHO ARE HELPING THE PEOPLE IN HAITI "
all pictures are very emotional.. but the last one is also full of hope. brought tears to my eyes.. i wish them all the best from now on. This is voyeurism at its best. The question is not whether you can show everything or not, but why you show them in these numbers.The world has seen enough of these sufferings and posting this amount of misery and suffering does not add anything to information. These pictures assure us that we are different, our fate is different and our future is different. These pictures have been stolen on voiceless, sometimes dying persons. These pictures do not belong to the photographers who made them. Fotos que mostram como somos fracos perante a natureza! Que alÃ©m das grandes potÃªncias mundiais, os demais paÃ­ses ajudem o Haiti! May God help Haiti. Be thankful for what you have. Think of how fortunate we are in this country. God bless Haiti. Great pictures... So much pain..... Thank you for showing these images. Excelentes fotos! sin duda nos muestran la realidad tan cruda qeu vive haiti en estos tiempos! poor people and how happy should be all that workers , wherever they come from, who had the chance of helping Haitian people. ENTRE TODO LO QUE DEBEMOS DE HACER, LA MAS IMPORTANTE ES PEDIRLE A DIOS QUE VOLTEE HACIA ELLOS, ORAR TODOS LOS DIAS PORQUE SE RECUPEREN Y DIOS LES DE LA ACEPTACIÃ“N ANTE ESTA DESGRACIA, DESPUES DE VER ESTAS FOTOGRAFIAS................................................ QUE DIOS LOS BENDIGA. mucha paz para aquellos que quedaron con vida y fuerza creo q si todos aportamos un granito de arena para ayudar no importa q tan lejos estemos el dolor lo vivimos de cerca FUERZA HERMANOS AHITIANOS!!!!! So impresive pictures, but I feel very bad about someone taking pictures of all this tragedy. IÂ´m not sure if it is ethical neither nice, cause the photographer should be helping people instead of taking advantage of the sufer and pain of others. Just for people like me and you, confortably sitted in front of a computer inside a clean and nice building feel closer to all this. If someone really wants to know how things are going there, they should go there and help. Not be looking all the horror in a screen, as it is fiction and not real life and real people. I don't hold anyone accountable for looting if they are looting water and food. I have four children and would do the same for them in a heart beat if I was in a situation like these people. What I don't understand is the people who loot other items that have nothing to do with survival. In one photo it states that a young women is caught stealing wall hangings. I know their is so much of that happening, that is why police respond, and it then can become violent. It's really sad that people commit crimes even in a time of such devastating pain and loss. y quien se acuerda de los pobres de nuestro pais que estan en miseria y tampoco tienen que comer y sufren sin haberles ocurido una tragedia, quien les ayuda a ellos. I am from sabah malaysian, so I see you got an earthquake in Haiti, when I observed from this picture, as I heard crying and noisy situations seek help, as ordinary people and simple that so sensitive to the incident involving the suffering of course I so pity with all the injuries and died in an accident, hope the Lord Jesus bless them and all members involved in this operation. joder vaya mierda de mundo, si existe Dios donde estÃ¡? Yo soy un poco pobre y no puedo ayudar cosa que harÃ­a de buena gana si tuviese posibilidad de poder hacerlo, pero los que estÃ©n mejor de recursos econÃ³micos deberÃ­an de ayudarles pues no hay nada mas bonito en este mundo que ayudar a alguien desinteresadamente, solo con su sonrisa de agradecimiento de esos pobres niÃ±os se deben de sentir pagados como con todo el dinero del mundo. Espero que sigamos dando el ejemplo que nos caracteriza como es conocido en los espaÃ±oles como el pueblo enormemente solidario que somos y de gran corazÃ³n para contribuir en estas causas. Wow! thats so sad i would hate to be in that position,and have you heard about that "Helping Haiti" song that Simon Cowell made its got loads of famous people singing in it like Mariah Carey,Robbie Willams,Suzan Boyle,Miley Cyrus and all sorts of other people.Its Great!